An event to support the arts and arts education programs in the Commonwealth. Action & IMPACT: Community Arts Advocacy Day is a multi-town event bringing together artists, art advocates, cultural organizations, and local businesses to participate in a day of grassroots activism and education to support the growth and effectiveness of the arts and arts organizations in Massachusetts. This second annual Community Arts Advocacy Day (CAAD) offers ten free workshops to attendees, as well as a variety of grassroots arts advocacy activities. CAAD will be held on Saturday, April 7 from 8:00 - 2:30 at the Franklin Senior Center. Attendance is free, though registration is required. In addition to members of the Franklin Cultural Council, Norfolk Cultural Council, Massachusetts Cultural Council and MASSCreative, MA Representative Jeff Roy will speak on how and why to advocate with legislators; he will also participate in one of the advocacy workshops, allowing participants to role play advocacy conversations with him. Any organization from any town is welcome to attend. To register for CAAD, go to: http://bit.ly/CAAD2018register. Volunteers are the backbone of many arts organizations. Finding them (and keeping them!) can sometimes be difficult, but is an integral part of your group's success. Learn tips, tricks and proven strategies from Karen, who has a wealth of experience dealing with volunteers as the Director of the Sherborn Council on Aging. Learn how to build a marketing plan for your arts organization from the ground up! Stacey has more than 20 years of experience in marketing and public relations, and will walk you through the steps of creating a successful marketing plan. Elements include: PR, advertising, social media, special events, marketing collateral, newsletters and more. Many arts organizations are volunteer-run or have small staffs and small budgets…but that doesn't mean you can't market yourself! Stacey can teach you how to market on a shoestring. Arts and culture enrich community growth, empower individuals, cultivate youth leadership, and provide a whole that is greater than the sum of our parts. What is the sum of our parts? How do we recognize our role in elevating the power of culture with our partners? The MCC's new Community Initiative focuses on building partnerships among local cultural councils, cultural districts, municipal officials, and the broader arts and culture sector at the local and regional levels. Join Mina Kim, Program Officer for the Community Initiative, to learn about existing and potential networks that have taken root through the Initiative, and how to cultivate meaningful collaborations that bolster support for your work. Learn to leverage the power of social platforms like Facebook, Twitter, and Instagram to connect to your community and amplify your message. Charity and Taylor will give you a crash course in the basic usage of the most popular social media platforms, along with tips and advice on which platforms are best suited for use in various circumstances. You'll get tools and techniques to boost your reach and maximize engagement with your target audience, and a chance to practice posting, liking, sharing, tweeting and adding friends in real time with a workshop full of new social media followers. No social media experience necessary! You will need to bring your smartphone and/or laptop to this workshop. If possible, please have the social media apps pre-installed on your devices beforehand. For many, the budget portion of a grant proposal causes real anxiety. Join Barb, a grant writer for Tufts University, and Lillian, a former grant writer for the MFA, for a step-by-step walk through of how to design and prepare a great budget and budget narrative, and take the stress out of this critical piece of the process. Local businesses and arts organizations can create mutually beneficial marketing and special events, forging lasting symbiotic relationships. Partnership events allow arts organizations to expand their reach and public awareness while creating good PR, revenue, and enhanced branding for the business partner. Learn the many ways that arts can partner with businesses and brainstorm how to create a partnership event in your own community. Once you know the basics, it's time to build a strategy! This workshop is a great sequel to our Social Media Basics workshop and can also help organizations with an established social media presence maximize their efficacy. This session will help you craft a strategic plan for using social media to your advantage. Topics include: tips for using hashtags effectively across platforms, using a consistent voice and style, developing a social media schedule, creative ways to consistently engage your followers, live functions, and more. Have a specific question about an upcoming funding announcement? Looking for ideas to make your grant proposal stronger? Wondering how to design a budget for a project you’ve never done before? Not sure how to go about your first grant application? Then come with your questions and ask the experts! Lillian Gould and Barb Gardner together have over 20 years experience in grant writing and are available to help you. Tamara is currently a web producer for NBC Boston and New England Cable News, and knows what it takes to grab the attention of the press. This workshop will focus on how to write a great press release, managing relationships with editors, examples of impactful "letters to the editor" that support your arts and advocacy message, and more! Representative Roy will talk to us about the issues he faces regarding State arts funding budgeting, the objections his colleagues might have to supporting the arts, and how to successfully address those objections when advocating. Emily, Program Advocate at MASSCreative, will then guide people in coming up with talking points and "scripts" for advocacy meetings with legislators, giving time to role play these meetings with Rep Roy and others. 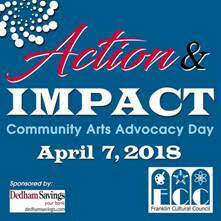 Action & IMPACT: Community Arts Advocacy Day is a program of the Franklin Cultural Council, with additional support from the Norfolk Cultural Council, MASSCreative, the Massachusetts Cultural Council, and our sponsors Dedham Savings Bank and Whole Foods Market. All advocacy activities and workshops are offered free of charge, however, a suggested donation of $10 per registrant is appreciated to help offset the cost of breakfast and lunch. To register for CAAD, please go to: http://bit.ly/CAAD2018register.